Cam Motion gives LS enthusiasts and racers the fastest turn around and more design options than any other LS camshaft manufacturer. This means you can get the exact camshaft you want and get it fast. 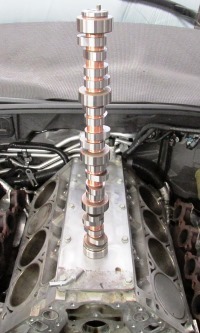 Below you will find links to a short-form and long-form custom camshaft questionnaires. If you have a stock or near stock vehicle and/or have limited technical knowledge, use the short-form questionnaire. If you have a highly modified or competition vehicle and have more extensive technical knowledge, please use the long-form questionnaire. Giving us as much technical information as possible will help us give you the most accurate custom camshaft design for your application. Getting as much info as possible from the questionnaire will also make the communication process more efficient and help us make your custom camshaft sooner. If you purchase your recommended camshaft, we issue a credit for your camshaft recommendation fee! Want to spec your own camshaft? We make it easy to get exactly what you want. No more searching through cam lobe master catalogs hoping to find a cam lobe that is available in the lift and duration that you want. Just tell us the lift and duration you want and we will make it. It is just that easy.